Posted by Dave Emory ⋅ March 14, 2014Post a comment Email This Post Print This Post Tweet This! Contrasting the OUN/B and its affiliated organizations as truthful and just, contrasted with “everything Soviet” as false and evil, Yuschenko successfully effected a wholesale revisionism of Ukrainian politics and history. 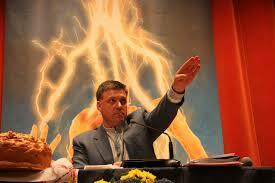 In Canada, Tiahnybok was honored by veterans of the 14th Waffen SS Division. In the Ukraine almost a year later, Swoboda held celebrations of the division, featuring and honoring veterans of the unit, returning the grace and favor deferred upon its leader. The Swoboda and Pravy Sektor-dominated government’s formation of a national guard, to be comprised of “activists”–the Swoboda and Pravy Sektor fighters, no doubt. Pravy Sektor’s moves to recruit fighters to engage the Russians in combat in the Ukraine. The UNA-UNSO, a Ukrainian fascist combat unit that has engaged in combat against Russia in Georgia and Chechnya. They were present in Kiev during the demonstrations. The presence of a jihadist element among the Crimean Tatars. Potential Saudi Arabian participation in an anti-Russian coalition. 1. Most of the program concerns the Yuschenko’s deliberate and fundamental remaking of Ukrainian history and ideology. Having literally created an Orwellian “Ministry of Truth,” Yuschenko’s government paved the way for the political midwifing of the Swoboda party–the heirs to the OUN/B. 2. Next, the program notes the formation of a 60,000 strong national guard in Ukraine, to be commanded and staffed by the OUN/B successor organizations Swoboda and Pravy Sektor. “Ukraine Creates National Guard Ahead of Crimea Vote”; BBC News; 3/13/2014. Ukraine’s parliament has voted to create a 60,000-strong National Guard to bolster the country’s defences. The vote came ahead of Sunday’s referendum in Crimea, now controlled by pro-Moscow forces, on whether citizens want to join Russia. President Vladimir Putin insists Russia is not to blame for the crisis. . . .
. . . . The new National Guard is expected to be recruited from activists involved in the recent pro-Western protests as well as from military academies. Ukraine’s national security chief Andriy Parubiy [from Swoboda–D.E.] said the Guard would be deployed to “ensure state security, defend the borders, and eliminate terrorist groups”. . . .
Pravy Sektor’s moves to recruit fighters to engage the Russians in combat in the Ukraine; the UNA-UNSO, a Pravy Sektor combat unit that has engaged in combat against Russia in Georgia and Chechnya (they were present in Kiev during the demonstrations against the Yanukovich government); the presence of a jihadist element among the Crimean Tatars; potential Saudi Arabian participation in an anti-Russian military coalition. “Cold War Images”;” German-Foreign-Policy.com; 3/12/2014. Alongside the “Pravi Sektor,” whose ranks have been dramatically reinforced in the course of those protests supported by Berlin, another group drawing attention in the Crimean context are the Crimean Tatars. This 280,000-member Islamic minority also has a Salafist wing, some of whose activists have combat experience from the Syrian conflict. One of the Crimean Tartar leaders was quoted with a prognosis that it should be expected that, at least, a few of those with combat experience will attack the Russian troops in the Crimea in the future. “They say: ‘an enemy has entered our land and we are ready’,” he is quoted saying. Observers point out that, on the one hand, Salafists fighting in Syria, often have the best links to Saudi Arabia and that, on the other, massive protests are now taking place in Saudi Arabia against Russian measures in the Crimea – based on the bogus allegation, Moscow wants to kill the Crimean Tartars. Saudi media propagates that in the Crimean War of the 19th Century, Arab Muslims had also fought the Russians. Riyadh, which is participating in this anti-Moscow media agitation, is one of the West’s – Germany’s as well – closest allies in the Arab world. This dictatorship has already joined forces with Western powers against Moscow – in Afghanistan in the 1980s. Kiev’s Independence Square is becoming a military recruitment center, with activists eagerly enlisting as volunteer soldiers. Anna Nemtsova reports from the scene. Kiev’s Independence Square – the Maidan so immensely important to the new government here — is changing all the time. And while most of the world’s attention has been focused on Crimea, some of the developments among the crowd in Kiev are decidedly ominous. Broadly speaking, the Maidan is turning into a military recruiting center. In two weeks, the new Ukrainian government is determined to mobilize more than 20,000 volunteer soldiers, and the square is a magnet for enthusiastic enlistees. The Ukraine mobilization was declared on the stage the Maidan on March 1st, the same day the Russian Parliament voted to authorize cross-border military action, giving president Vladimir Putin carte blanche for the possible invasion of Ukraine. Since then most former activists among the protestors, now turned volunteer soldiers, both male and female, have put on full camouflage uniforms and attend military training outside of Kiev. But there are also men in black – precisely the kind of people Moscow gleefully brands as fascists to terrify the ethnic Russian populations of Crimea and in the east of the country. Members of the Right Sector nationalist paramilitary group have occupied three buildings around the Maidan square over the last few days. New recruits for their forces lined up outside the former office of Kiev Star, a cell phone company and militia activists carried bags full of weapons into the guarded door. The Dnipro Hotel is with the Right Sector’s men dressed like down-market storm troopers. The movement’s leader, Dmitro Yarosh, has also changed into black. A Russian court recently accused him of extremism and long-term involvement with the Chechen Islamist underground. Yarosh said in a recent interview he predicted “the nationalist revolution” many years ago. He defined his main enemies as the Russian Federation and the Russian Orthodox Church. Many supporters of the Maidan disapprove of the Right Sector’s political game, as it was not just Right Sector, and the Sova Center of Information and Analyses, an independent organization monitoring racism and xenophobia, confirms their core complaint. “Right Sector members were involved in racist attacks and attacks on their opponent,” says Sova’s head, Aleksander Verkhovsky. If you listen to Yarosh, you’d think that the scores of people killed in the Maidan uprising last month were all his men. In fact, most of the people slaughtered at Kiev’s barricades were ordinary citizens. But the violence and unrest have played into the Right Sector’s hands. At this chaotic and perilous moment, Ukrainians are willing to accept such organized protection as they can find. “Yarosh and Right Sector provide my own security,” says Natalya Isupova, the mother of four children, who lives in an apartment near the square. Violence has not left the Maidan altogether. On several occasions drunk or frustrated campers loosed a few rounds from their guns and blew up fireworks in the middle of the night. “Once, they wounded a suspicious character and another time there was a conflict between Right Sector and self-defense forces that led to shootings,” Pavlenko said. But the campers consider those exchanges of gunfire “minor accidents” compared to the real challenges: the war threat and responsibility of trying to guide the new national leadership. “In fact, there is no law enforcement organ today that could control life on the Maidan,” says retired Major General Petro Garashuk, now advising the parliament on military reforms. “The parliament cannot take control of the Maidan, it is the Maidan that controls our new leaders; in case they disappoint people, there will be a new revolution,” Garashuk said. Just recently, most volunteer soldiers of the so-called Defense Army of the Maidan were immature street fighters armed with Molotov cocktails and plywood shields against Ukrainian state police forces. Since last November, when police beat the first pro-European Union protestors on the Maidan, the campers have survived bitter winds, rains, snow, freezing winter, police attacks and sniper bullets. They never really had time to celebrate what they considered their victory – the day president Victor Yanukovych fled the country. Bad news continued to rain down: earlier this week, one of the Maidan activists was killed by pro-Russian protesters in Donetsk, and several activists vanished or were arrested in Crimea. Volunteer psychologists, aware of increasing depression on the Maidan, are trying to provide first aid for campers in the heart of Kiev, as well as for the first refugees arriving from Crimea. Instead of medicine, doctors prefer to treat their patients with a comforting chat in relaxing atmosphere. Specialists also encourage the Maidan’s defenders to have more romance, and that notion seems to be catching on. With spring coming to the Maidan, the crisis center at the Ukrainian House, a block away from the square, recently celebrated three weddings for the self-defense forces. Yelena Fomina provides free psychological help at an improvised office occupying a former McDonalds ron the corner of the Maidan. This week was especially difficult emotionally, Fomina told The Daily Beast. Specialists had to deal with a new wave of psychological traumas linked to the Crimea referendum and Russian threats: the conflict has came to almost every family in Ukraine, splitting relatives into pro-Russian and anti-Russian camps. “Talking about their love for Ukraine, their devotion to this land, to their country, helps better than any medicine,” Fomina said. As the article points out, one of the characteristics of the revolution in Ukraine is that the protestors haven’t really had a chance to celebrate and psychologically unwind. The very act that catalyzed the protest, the mystery sniper massacre on the Maidan, was also a horrible tragedy for for the protestors that took the brunt of the volience. And any euphoria in the victory that followed – President Yanukovich fleeing Kiev – was almost immediately swept away by the immiment conflicts in the East and Crimea. It’s one reason why the depression settling into the Maidan is so depressing: it’s self-reinforcing depression. The less hope there is for a Ukrainian society that’s moved past that sad state of ethnic division the greater the incentive to embrace the far right and create ethnically divided states. Demonstrations broke out in cities across eastern Ukraine on Sunday, with thousands of protesters demanding the right to hold referendums on their future status, taking a cue from the Russian-controlled vote in Crimea. With Russia cementing its control over Crimea, the stand-off between Moscow and Kiev is shifting to the largely Russian speaking cities of eastern Ukraine. Russian forces have been holding manoeuvres near Ukraine’s eastern border, while Ukrainian media have shown the Ukrainian army positioning troops near the frontier. Donetsk, Ukraine’s coal and steel capital, has seen weeks of pro-Moscow demonstrations. The protests turned deadly late last week, when a group of pro-Russian demonstrators attacked people showing their support for the Kiev government. One protester, a member of the nationalist Svoboda party, was stabbed to death. Karkiv, Ukraine’s second-largest city, also saw deadly violence on Friday, with two pro-Moscow demonstrators killed during a stand-off with activists from the nationalist Right Sector movement. On Sunday, pro-Russian demonstrators marched down Donetsk’s main street, then stormed the prosecutor’s office, tearing down the Ukrainian flag from the building and replacing it with Russian flags to cheers of “Donetsk is a Russian city” from the crowd. Protesters then attacked the office of Serhiy Taruta, the millionaire recently appointed the region’s governor by the new government in Kiev. In Kharkiv, demonstrators gathered outside the Russian consulate, calling for Russian intervention, while in Luhansk pro-Moscow groups staged their own unofficial referendum. Ukraine’s SBU security service also reported that it had arrested a group of people in Zaporizhia, seizing firearms and explosives the agency said were going to be used to destabilise the situation in the region. Although the protests have been occasionally violent, they have only succeeded in attracting relatively small numbers. In Donetsk, a city of 1m, the prediction had been for a crowd of tens of thousands on Sunday. The demonstration in Kharkiv was also only about 3,000 strong, according to local media. Those taking part in the marches are largely older people, many of them nostalgic for the days of the Soviet Union, bolstered by a strong contingent of burly young men wearing black jackets and sporting knitted caps. Although the Russian government and media point to the danger faced by the region’s Russian speaking population at the hands of the new Kiev government, almost all the violence in recent weeks has been directed at demonstrators showing their allegiance to Ukraine. Middle class and younger people, who have spent two decades in independent Ukraine, tend to be warier of the demonstrations, even if they have mixed feelings about the new administration in Kiev. It’s increasingly looking like we once again are seeing a revolution that was initially rooted in the spirit of “a pox on all houses, end the corruption” successfully get hijacked by the far right. Fortunately, the bulk of the populace still appears to largely reject the horrible worldviews of groups like Svoboda and Right Sektor. But insecurity has always been one of the best of friends of the far right. So the formation of far right militias in Kiev combined with the situation in Crimea and the separatism in the East (that one would expect in response to the sudden rise of Svoboda and Right Sektor), it’s looking like the far right in Ukraine has fewer and fewer reasons to be feeling down. And that’s pretty depressing. Given how miniscule $15 billion (or even $50 billion) is when you’re looking at the combined budgets of the NATO allies, it’s pretty hard to hard argue that the West can’t actually afford to offer Ukraine more. No. It’s about doing the right thing.